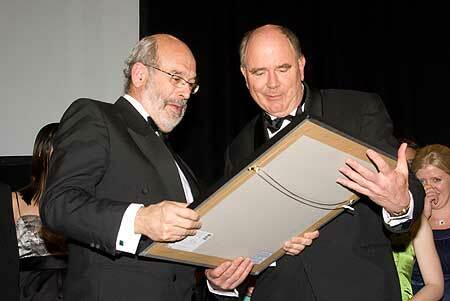 Professor Vince Neall (right) with Professor Peter Gluckman at the Massey Research Medals dinner in Wellington in October. The Council of the Royal Society of New Zealand has elected Professor Vincent Neall from Massey University as a Companion. The title of Companion is an honour recognising outstanding leadership in science, and contributions to the promotion and advancement of science and technology in New Zealand. Professor Neall has taught earth science at Massey University since 1973 and is one of New Zealand’s leading experts on volcanoes. The president of the Royal Society of New Zealand, Dr Garth Carnaby, said the election of Professor Neall as a Companion was formal acknowledgement of the significant role he had played in the regional science centre movement and his many contributions to community education about hazards associated with volcanoes. “Vincent has achieved a high level of recognition in communicating and interpreting science to the wider population at all levels over many years. The Award of the Companion of the Royal Society of New Zealand was introduced in 1999 and there are now 29 Companions.